I was standing right in the middle of the swinging bridge, with my hands tightly holding onto the railing. The wind was whispering and moaning while carrying snow particles. It was the kind of strong winds I had never experienced before in my entire life. 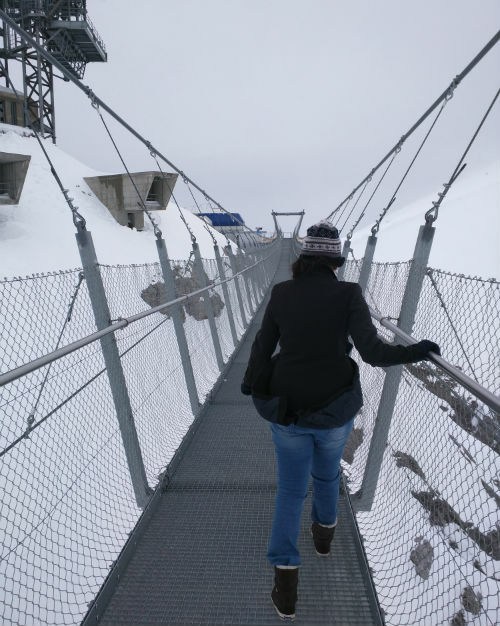 Not only were they freezing cold, they were also strong enough to push me to the other railing of the bridge if I was stupid enough to let go for a second. Every time I turned my face towards them, it was like receiving a cold, tight slap from nature. My parents were far behind. I could see them struggling against the force too. I was nearly at the end so I spread my arms and ran along its remaining length. This had definitely been scary. My face felt frozen, like my legs and arms. The wind was still howling in our ears. When Mom and Dad caught up with me they had what-were-you-crazy-enough-to-run look on their faces. We just shrugged. There was a cabin nearby and the staff inside looked pretty cheery when they saw us, which I thought weird, especially since the entire thing felt like a life-and-death situation. We said we’d take the bridge again. The first time getting across had been scary because there had only been five people on it totally, including the three of us, so it suddenly felt like it was the wrong way. But then we saw all these other people on the other side getting ready to cross it and we felt instantly relieved. The second time was much more fun and hilarious. The bridge swinging now felt normal and everyone had their coats flying around their heads, and bags trying to soar, and snow hitting their faces. It was humorous to see everyone. We later found out that the bridge we’d crossed twice was actually the highest suspension bridge in Europe, and had also been called one of the scariest bridges in the world (no argument there). Mom said, had she known this earlier, she would have never attempted this. Mom said NO, she was fine.